Here is a very special stallion and the first son of Florencio 1 in the State Stud stables at Celle. Furst Nymphenburg is a beautiful type with a dark chestnut coat. He is very correct in conformation and he knows how to show off himself under saddle in his movements. He has a powerful, ground covering, uphill going canter and he combines his trot, powerful from behind, with the swinging back and lots of freedon of the shoulders. This stallion has a very impressive pedigree: Florestan 1, Weltmeyer, Donnerhall, De Niro and Argentinus. Father Florencio 1 was the World Champion of 2004 and 2005 for young dressage horses with high scores of 10 for canter, 9.7 trot, loose walk 9.6, and overall presentation 9.9. Due to his successes in sports and the high quality of the foals from his first crop, the Oldenburg Verband awarded Florencio 1 the 1a Main Premium in 2004. 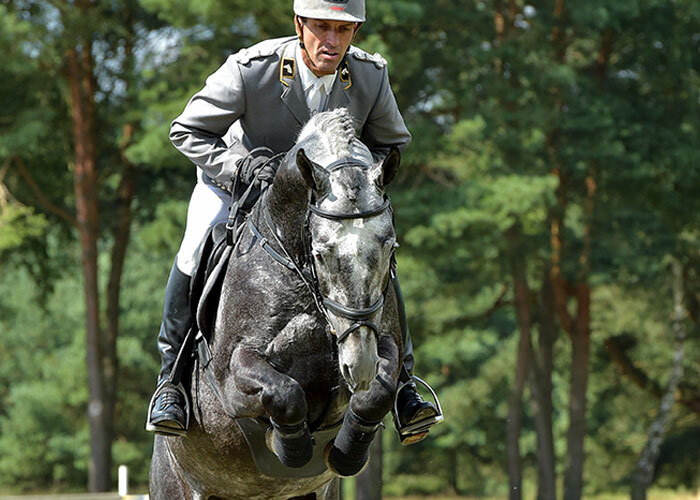 In 2006 one of his sons won the German Foal Championships in Lienen and afterwords became one of the top-priced horses at the auction in Vechta. Six of his sons from his first crop received the breeding licence in Vechta and Munter-Handorf among them several Premium Stallions such as Fontane. On top of this he had five sons in the Oldenburg Keuring 2008. The dam sire De Niro is the Hanoverian stallion of the Year 2008. His foals dominated the German foal championships and foal acutions for years. More than 60 sons have been licensed and Der Lord was recruited for the State Stud Celle. 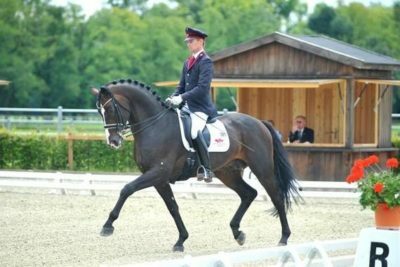 De Niro’s best son by far was Dancier, Champion Stallion of the 2004 Hanoverian licensing, who was also sold to the State Stud Celle for 330,000 Euros, and then won bronze at the 2006 Bundeschampionat. In 2005 De Niro was the dam sire of the Champion Stallion of the Hanoverian licensing and stallion performance test winner, Hotline. 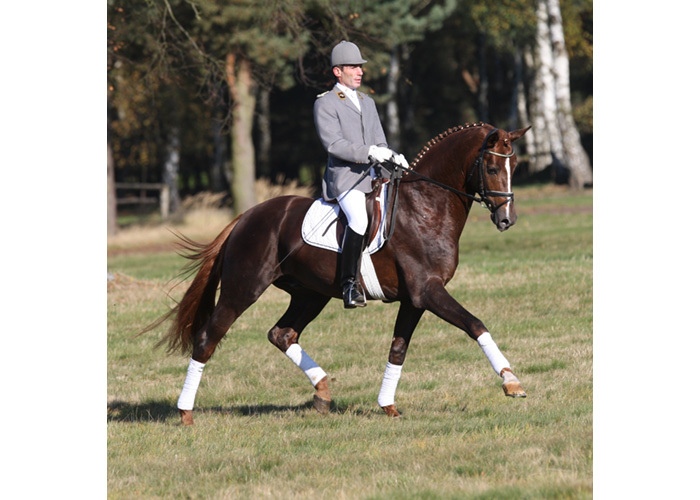 Fourteen of his progeny participated in the 2006 Bundeschampionat, by far the largest lot by a single sire and several of theses were highly placed finalists. Individual scores at performance test: 8.5 character, 8.5 trot, 8.83 canter, 9 walk, 9 rideability, 6.67 free jumping, 6.25 show jumping, 8.56 cross country. He was champion of the performance test and the dressage section of the test. He presented his first foal crop in 2009 which was a breeding highlight. His foals were breathtaking. Every single foal had a lot of presence, displayed elegance and an active hindquarter. This stallion obviously left his mark on his progeny and is the perfect match for different bloodlines…L, W, B, or D bloodlines, all his foals were obviously the spitting image of their sire. The above-average quality of all Furst Nymphenburg foals at the first inspection of progeny in Adelheidsdorf was simply sensational. They were true to type, long-legged, and big movers. “Athletic, always presents himself perfectly, a beautiful face, four correct legs and an energetic trot”, was Manfred Schafer’s comment on a chestnut colt by Furst Nymphenburg. In his first season 17 foals already qualified for the Hanoverian auction. He has 5 licensed sons, 70 state premium mares, and 144 auction horses. HLP 2008: 134.98/ 1 /38 ; DI 147.23/ 1 ; SI 101.11/ 10 .